First, I'd like to thank Ben Cole for providing the link and clarification in the other thread. Regarding the $2.5T bank reserves; when the banks lend this amount back to the Fed are they currently receiving Fed Fund rate of about 0.11% annually? The banks lend to speculators at cheap rates to inflate stocks and commodities. No demand for other lending. I guess the question is how do I form a bank to collect interest on excess reserves. People outside the US holding the currency because they 'want' to? Is that kinda like people 'wanting' to hold gold? Does that mean these people think the US currency is similar to 'gold'? Wow!? surf: yes, that's exactly what they think—that the US dollar is as good as gold. And much more convertible to boot. Why do they think that? Because their own currencies have had a record of failure. 1. I sincerely appreciate this blog-post, and the effort made to wrangle with a vexing topic---a task made exasperating by the Fed's insistence on opaque language, reportage and verbiage. I am not criticizing anybody--I am only asking about the math. 2. The numbers in the chart you present don't add up. Eyeballing the Fed liability and assets chart, we see what looks like $800 billion increase in currency, and reserves up by $2.5 trillion. Total $3.3 trillion. Fed assets are up $3.8 trillion! 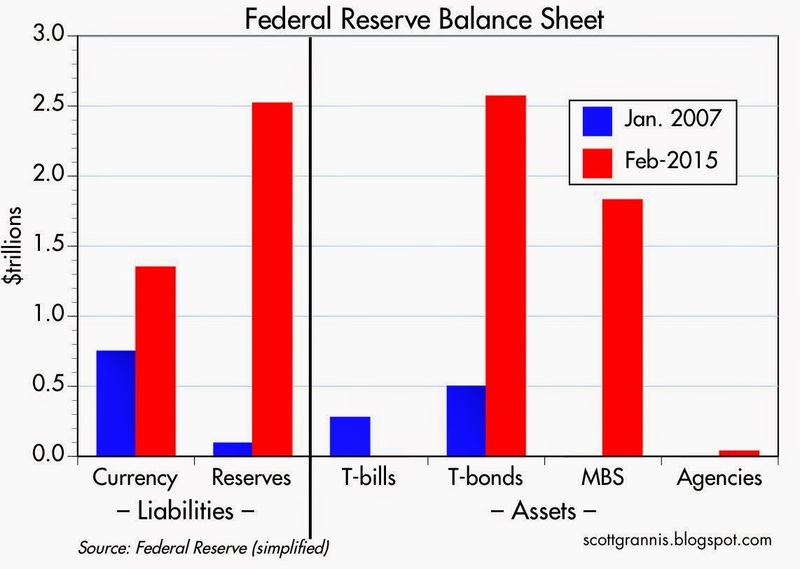 Even counting in currency (and I think that figure is high), we see Fed assets rising $500 billion more than liabilities. Something does not add up. LIke Everett Dirksen said, "a billon here, and a billion there, and pretty soon you are talking real money." 3. I think a fair "criticism" is that no one knows what happens to U.S. paper money, or how often it circulates in one year. The Fed says it does not know. I don't know either. The fresh (net) $500 billion in paper currency printed and circulated since 2008 may have entered the grey underground economy in the United States, or it may end up in briefcases in international drug cartel black markets. Likely a mix. I am told that the Euro 500 paper note is the preferred illegal paper drug currency, as Ben Franklins are too bulky. I have even been told that is all mumbo-jumbo, that precious stones, such as diamonds, are used in many illegal drug transactions, as diamonds are much smaller than paper currency, and reporting rules are easily bypassed when routing diamonds around the world. Since diamonds have uncertain value, I do not "trust" this explanation. When I lived in the U.S., I never knew anybody who stored value in the form of paper currency (yes, I had boring friends and associates). I did know of many grey-underground businesses that worked heavily in cash, such as restaurants, furniture builders, small shops of any kind, small construction firms, home remodelers. A city like Los Angeles has a large grey economy. Ergo, I suspect that some portion of the additional $500 billion in circulation since 2008 must have entered the general economy, and unless velocity of paper money declines, must be stimulative. I rather suspect also that while the Fed balance sheet is one topic, there is still another topic: What did the bond-sellers do with the $4 trillion they received from the Fed? When the Fed buys bonds, it credits the accounts of Primary Dealers, at depositary institutions. The Fed only buys bonds from the 22 primary dealers. Ergo, when the Fed buys bonds from the PDs, it creates out of thin air the reserves, and credits the PD bank accounts. But the people who sold their bonds to the PDs have ANOTHER $4 trillion in (digitized) cash. I resubmit that QE is stimulative in many ways. Benjamin: the missing $500 billion can be found on the link I provided. It's mainly reverse repos and "term deposits held by depository institutions." It's not mysterious. I excluded those items because they are "obscure" and in order to focus on my main point which is to demonstrate that the Fed has not been printing massive amounts of money. I hope you have a great ski trip. I was a Alpine racer for 8 years thru high school (Missoula MT) and college at U of M (University of Montana) Raced in the NCAA Championships for four years 1969 thru 1972. Also I always loved the skiing in Utah (especially racing) at Park City in Utah (traveled all over the Northwest for competitions) and my daughter and her husband still live in Bozeman MT very close to Big Sky….I have skied at Big Sky a couple times but i am a bit partial (probably prejudiced) to Bridger Bowl, also just outside of Bozeman (I raced there a lot!!!) including the Junior National Championships held there in 1968. HAVE FUN!!!! as I still love venturing back to Montana (50 year High School class reunion due in 2018) and I am highly confident you will really like the area! AGAIN…..THANK YOU for ALL the great data/info that you provide. BTW, cash in circulation from Jan 2007 to present is up only about $500 billion, not $800 billion, to a total of $1.34 billion. So...the math...well I give up on the math. But you gotta come up with $300 billion. Given the size of the grey market, I would say all that cash in circulation is stimulative. Which I think is a good thing---people are probably doing better than the moaners and groaners say, but it is not showing up in official stats. Still, inflation is dead as a doornail, so we could do with even more cash in circulation! Regulatory capture can happen to any federal agency. It is worth noting that the Fed devised a stimulus plan that resulted in unknown amounts of transactions fees for the 22 primary dealers (I guess fees on $8 trillion of transactions, that $4 trillion of buying bonds, and another $4 trillion selling bonds to the Fed), and also in 0.25% interest on $2.5 trillion parked in depositary institutions (commercial banks). I happen to think the QE was stimulative anyway, as the people who sold bonds to the Fed, now have $4 trillion in cash, whereas before they had $4 trillion in inert assets. Even the $500 billion in net additional paper cash in circulation since 2008 must be having some effect. But...monetizing tax cuts might have been a lot more stimulative. zumbador: You're welcome, and thanks for the nice comments. Big Sky is one of my favorite places (the weather has been ideal and the snow almost ideal), alongside Deer Valley and Keystone. We're in Big Sky with an old college buddy who lives in Great Falls and has skied everywhere. TOKYO—The Bank of Japan’s aggressive purchasing of stock funds has helped Japanese shares climb to multiyear highs in recent months. But some within the central bank are growing uncomfortable about the fast-paced rally and the bank’s own role in fueling it. Why is there no outrage at this manipulation? Anything goes now if its done by a Central Bank? Japan Stock Market - it's even worst than I thought! Analysts say the BOJ’s action has been a significant driver of Japan’s stock market rally in recent months, combined with hefty purchases by the Government Pension Investment Fund. Their buying has often countered selling pressure from individuals in the market and made up for a weaker appetite among foreign investors. The BOJ has stepped in mostly when market sentiment was weak. Three-quarters of the central bank’s buying occurred on days when the benchmark Topix index opened lower, according to a Wall Street Journal analysis of BOJ data. Google this title: BOJ Helps Tokyo Stocks to Soar to read. Re: BoJ buying stocks: according to the article linked by William, the BoJ has bought a total of $23 billion of equities in the past 2 years. That is a very small fraction (0.5%) of the ~$5 trillion value of the Japanese equity market. More meaningful, probably, would be the purchases of equities by the government pension fund, with assets of more than $1 trillion. This would be symptomatic of the Japanese becoming less risk averse (they have been excessively risk averse for a long time). So this might be more a return to reality than an embrace of artificial stimulus. The Nikkei 225 and the DJIA were both at about 18,000 earlier this year. The Nikkei just blasted through 19,000. The DJIA is below 18,000 now. The yen is getting cheaper. The BoJ is doing QE.